Back for a quick update, busy with work. When traveling abroad tourists always want to get the most bang for their buck. When traveling in Peru it is important to know the do’s and dont’s of money exchange. In Lima the airport has various atm’s and a money exchange on the lower floor just before you exit near the coffee stand. It’s okay to change some dollars for soles here but the rate is usually a few points off the prime rate. I normally change just outside the center of lima in one of the places the guys in the vests go to do their own changes. I won’t tell where my spot is because I don’t want every gringo out of san anton showing their touron self there but I will suggest a few good alternatives that bring close to prime rates. First, dont do it at any of the hotels or eateries as you will get screwed on the rate. Rule #1 look for the guy in the neon yellow vest, normally sitting atop a bar stool on busy street corners. The proper way to ask is, “quanto es el cambio por favor” or “quanto es el dolar” last extended stay was normally 2.85 but I was able to change for 2.92 at my un named establishment. It was a little out of the way but a big safe place none the less. Normally in Mira Flores one pays a higher rate somewhere in the 2.80 all the way down to 2.70 in the wee hours of the morning. Rule #2 DOS, you guessed it don’t change your money at night on the street. It is hard enough making sure you have gotten all of your bills let alone checking that they are legit in the dark street lights. I rarely change large amounts at night but have in Mira Flores near the McDonalds but not too late. It was around 11 PM local when I did it there a few times and needless to say I got screwed on the rate but if you are out for the party then you have no choice. #3 always check around. During the day time it is not uncommon to see several neon clad money changers on a street corner. In plaza de armas try the guys in front of bembos. There is also a reliable place a few doors down on the side of the pizza place but watch out as he tried to give me a fazool last time and I told hime to give me a new bill. It was a fake 100 sole not you could tell because the foil wasnt glittery. Be careful out there and its best to use the guys in the jackets they are most reliable. Gamara: Check close to the food court near the main entrance by Pizza Hut. Chabuka: Here you will need to go back to Plaza De Armas and try Bembo for the ATM or the Bank down by the shops on the pedestrian mall. Cusco : Plaza de Armas is the best place here plenty of ATM’s and you’ll want to go inside one of the shops around the square to exhange money look for Dollar Euro signs in yellow. If you can’t find one just ask someone. They are in most of the places in the square like the internet cafe’s. Most Bank ATM’s will give out dollars or soles. I always get dollars and change my money as needed. There are usually plenty of neon vested fellows to help. They should all have a calculator you can use if you need too. Good luck and stay safe and smart. Cruz del Sur aka Curz del Sur Not Recommended! I want to start off with saying I am completely disgusted with my entire experience with Cruz del Sur. Unless trouble is what you want on your journey I suggest that you try another bus line. While traveling through Peru with my Peruvian wife and our 3 kids we have taken many bus trips. Normally we try to get the best deal for the best service. After a fun filled week in Vichayito Beac, Mancora, Peru we had to get home. We were unable to get seats on Civa Exclusiva and decided to try Cruz del Sur for the first and last time. I have always compared the rates for Cruz del Sur and until now always chosen to take a more affordable bus line. They charge 12 soles that most of the other bus lines, and from the english website you get a feeling that it is a decent company. However, please do not be fooled with their advertising or shiney black buses. Upon purchasing our tickets we were given a discount of 5 soles per ticket which was kind of strange. We chose 160 degree seating as they assured us that it was the best seating for the price. I am 6 feet tall and 220 lbs. Not chubby but athletic and the lady at the counter smiled and assured me that I would be happy with the accomidations. The first problem we encountered was that the lady at the counter in Mancora said she did not have change. As we sat and waited for the bus to arrive several other would be passengers paid and we returned to the counter twice and were told that she still did not have change. I got the feeling that she was trying to steal 5 soles. As 2 other Cruz del Sur employees showed up for work I double checked my ticket which said 105 soles and then made certain the lady hear me tell my wife that if she didnt want to give us our change that I would be calling their corporate offices and filing a formal complaint. Not the way you want to start a journey to say the least. 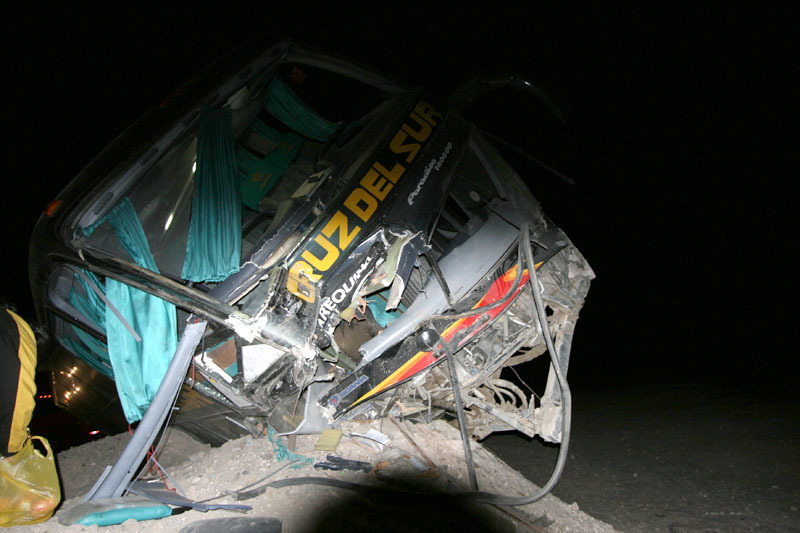 The Cruz del Sur bus arrived 25 minutes late and we were rushed onto the bus. Once on the second floor I was utterly appalled to find that we were going to spend the next 23 hours smashed into tiny seats with little to no leg room. The Civa bus had already gone by 30 minutes before or I would have demanded a refund. We had to get back to Lima for work and decided I would try to make the best of the ride as I spend 8 weeks living in the back of my compact Jeep Wrangler car camping in the Rocky Mountains and figured I could deal with not having ample room. The 3rd problem we encountered was when the bus departed from the station and then we knew we were in for a long bumpy and very uncomfortable ride home. The bus looked brand new on the outside but had to be over 10 years old judging from the seat padding and overall condition of the inside. The ride was rough and so bumpy that 2 of our children and my Wife vomited from the constant shaking from side to side. I liked the experience to being lashed to the main sail of a small sail boat during a category 5 hurricane. We kindly asked the attendant for some rubbing alcohol and motion sickness pills at the first stop to which he laughed and said there was no pharmacy. Then he moved on down the cabin to chat with the gringas onboard. A little while later we were served and the jerk attendant laughed and asked if I wanted all 5 of our meals as our kids were too sick to eat. The food was cold and mine looked like someone had chewed up some chicken and spit it out right on my plate. I did not eat this as I brought plenty of snacks on board. Following a few old movies in english with spanish subtitles we tried to go to sleep. The seats are not full 160 degree seats and there is no foot room. The seats themselves are also a little smaller than most coach airline seats and very uncomfortable. I was very tired and fell asleap for 51 minutes until I was awakend by the bus swaying from side to side. For the next 4 hours I sat there with my eyes closed and half awake. I got up and went to the bathroom and it smelled like a chicken farm and there was urine all over the place. We were served a muffin and a small sandwich for breakfast. We neared Lima and were stuck behind an traffic accident for about 45 minutes in the steep hills of Pasamayo where a truck had overturned. We got back on our way and passed the mega plaza in Comas before we hit grid locked traffic on the expressway. For the next 3 hours the driver sat in traffic moving less than 3 km. I undrestand traffic jams as I have encountered gridlock in NYC and LA but have no explanation for why the driver did not exit the expressway and get us moving. Instead he got into the far left hand land and just sat there. We arrived 4 hours late and encountered another lazy employee at the baggage claim. One of my bags was the last one off the bus and I stood patiently awaiting the bag handler who was too busy staring at the wall to get my bag for me. I asked for it 8 times in spanish before another employee handed it to me. On the way out a Cruz del Sur employee bumped into my oldest step daughter knocking her to the ground and did not appologize or offer her a hand getting to her feet. I have never before experiences such horror as this bus journey and I will never take Curz del Sur anywhere ever again. I plan to make it a point to inform all tourists visiting Peru about my terrible experience so that they will not make the same choose. Stay away from Cruz del Sur as you will regret it! I give them a rating of 0 Stars. If you wish to debate my ratings I welcome you to post in comments. We were heading to Punta Hermosa the other day on a Kombi bus that we got on at the station near Puente Santa Rosa close the Plaza De Armas. This ride we jumped on one of the small Kombi’s and were seated in the first row facing forward behind the driver. The driver was busy not watching the traffic that was stopped in front of us and was unable to stop when we collided with a larger tour bus at about 30 mph. I slammed my foot on the bench in front of us to brace and luckily was not thrown out the front window. My wife grabbed me and I sustained 2 deep cuts from her clutching my arm. Other than that we were just a little sore. The Kombi was totalled, the front windsheild knocked out and the engine locked up. The bus in front of us just kept on trucking and we walked to the side of the highway and demanded our passaje back. Then we boarded another kombi and continued on our journey. 1) Never sit in the front rows or back row. These Kombi buses are small and not well protected in the event of an accident. 2) make sure you have something to grab onto in case of a bus crash. Like a hand rail or your husbands arm, just try not to punch holes in his skin with your sharp fingernails. 3) When in doubt wait for another bus. If there is no where to sit dont get on. This video is courtesy of clemensa100 at youtube.com. Lima, Peru is home to thousands of homeless children. Chances are you wont encounter them for the most part in Miraflores. Venturing out into the other areas should be done during the daytime. Certain places like La Victoria and La Parada should be avoided at all times. Many of the homeless youth are forced into child gangs and are referred to as Piranitas or choros. They are known to rob, steal, use drugs and fight. They should be avoided at all costs. I recommend not offering any money or coins to them as if they know you have money you will have trouble. Interestingly enough last week alone I witnessed one Choro attempt to steal a locals purse as she jumped on a combi bus just ahead of his grab. Last night on the way home to Rimac in a Cab, near Lima Center and 3 minutes from the Plaza De Armas we witnessed 2 gangs of Piranitas thowing baseball sized stones over traffics at each other. Luckily no one was hurt and they ran off. 1) Never take valuables with you. Only enough money to get you to where you are going and for the essentials. 2Carry small denominations of currency and keep in multiple places. 3)Do not wear a wallet, its better to use a money belt or carry it in multiple inner pockets away from the hands of pick pockets. 4)Dress down, dont dress up to site see as you already stick out like a sore thumb. 6)Stay out of bad areas and be aware of your surroundings especially after dark. 7)Ask before you venture out. Most hostels will be able to get you headed in the right direction. If you dont know just ask as there is never a dumb question only dumb people that are afraid to ask. 8)MOST IMPORTANTLY: Police are not to be relied upon. Most nights you dont see any of them and normally they wont respond to incidents.